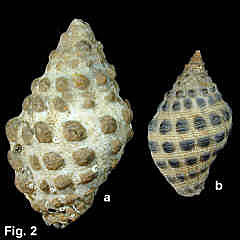 Description: Shell solid, with five spiral rows of nodules on body whorl, with a variable number of scaly ribs between. (The shell is usually eroded, so this fine sculpture is normally not present). Outer lip thick, curved, with four teeth internally, more or less the same size. Columella thickly calloused, smooth. External colour grey with black nodules; deep interior of aperture purple-grey, teeth white; outer lip cream or cream alternating with black or brown. 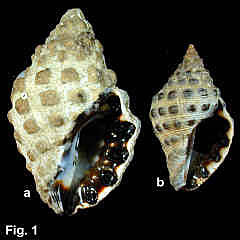 Size: Up to 35 mm in length, but usually less than 20 mm. Distribution: Northern Australia, from north-western Australia to Twofold Bay, NSW. (See comparison below). Habitat: On rocks on all intertidal shores. Abundant. Comparison: There has been debate as to whether this species is distinct from the widespread tropical Indo-West Pacific species Morula granulata (Duclos, 1832). However, the most recent work by Tan (1995) makes a convincing case for it being a distinct species, and presents the following comparison of characters. Morula granulata: Entire Indo-West Pacific Region, from eastern Africa to the eastern Pacific, including northern Australia from central Western Australia to Queensland. In Queensland, it occurs on the outlying area of the Great Barrier Reef. Morula marginalba: Northern Australia, from north-western Australia to Twofold Bay, NSW, on the coast and continental islands, and other islands of the central Indo-West Pacific.